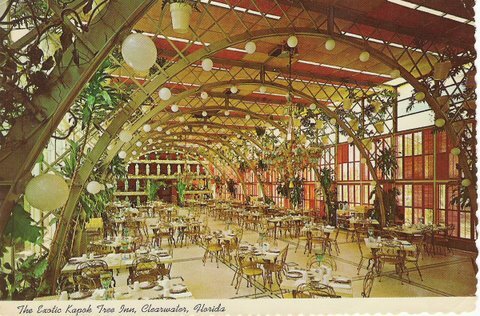 Florida natives and tourists old enough to have been around the Tampa Bay area for a while will remember the dining room shown in the postcards below. Just after the Civil War, a local resident planted a kapok tree from India on his property near the western shore of Tampa bay in Clearwater. People came from miles around over the years just to look at this tree. The 200-seat Kapok Tree Inn opened on the property in 1958 and immediately became a hit with locals and tourists alike. It offered fried chicken, broiled steak and baked ham served in a setting of fabulous antiques and tropical palms with the backdrop of the famous kapok tree and its offspring. The food was great, but even if it had been mediocre the dining ambiance and experience would still have been worth the visit. By the 1960's the New York Times and Holiday magazine named the owner of the Kapok Tree, Richard B. Baumgardner, as one of the top ten restaurant operators in the world. At its peak, the Kapok Tree had 12 dining rooms. 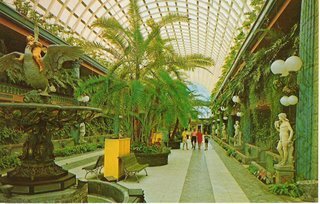 The restaurant was so popular they went public in the 1970's and opened several other Kapok Tree Inns in Florida and Maryland. The whole operation began to founder, however, and finally the last one - the original in Clearwater - closed its doors in 1991. Those of us who loved the place miss it a lot. See more photos at Only In Your State.